I love apple pie!! You are so brave making your own crust, I always buy the refrigerated!! Aw thanks! I am (or my entire family is rather) a pie snob. Brownies taste great from a $1 bag of mix but pie crust must be made at home and with Crisco, not butter or....gasp...margarine (does anyone ever buy margarine these days??)! Yum! Nothing is better than apple pie. I'm impressed!! I always buy refrigerated pie crust too, so I"m really, really impressed with this! It looks good and delicious! Mmmmmm! Does pie transfer well via USPS?! 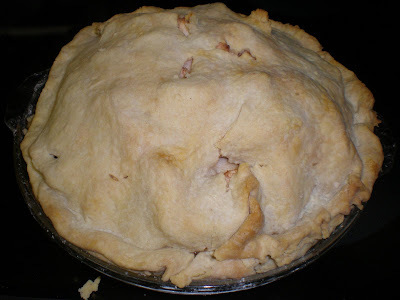 I am craving some apple pie right now. My mom makes her apple pie with Crisco too...I agree, nothing beats that! Yum! You seem like a good baker!